The Dallas ISD Transportation Department is requesting parent feedback and providing updates for Parents of students in Magnets, Academies, Vanguards, and Choice. Meetings will be conducted in February, March and April. Additional information can be found on the district’s website at dallasisd.org. For questions related to the meetings, please contact the Transportation Department at 972-925-5010. Please see the link for 2018/2019 Bus Route. This is the most recent draft as of 8/18/2018. Did you see that the Dallas Observer named Eduardo Mata Elementary as the "Best DISD Innovation" for 2015? Congrats to teachers and staff at our wonderful school who make Mata a great place to learn! 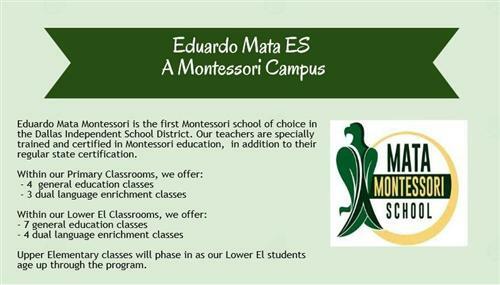 Learn about Mata's transformation under DISD's Public School Choice Model. PTA Meeting (Elections), Strings perf. April 27, 9:00 a.m.-12:00 p.m.
May 4, 9:00 a.m.-12:00 p.m.
May 11, 6:30 - 10:00 p.m.
May 18, 4:00 - 7:00 p.m.
May 21, 5:00 / 6:00 p.m. Morning Drop-off - 7:15 a.m.
Breakfast in the Classroom - 7:45 a.m.
School Starts - 7:45 a.m.